Thanks, it is a good one. Tis' the time of the season for new riders in the North. I love how they've started as if you've already taken the course, as if it's essential and required; because it should be. It is in WI if you are under 18 and want to get a cycle license. Both my boys had been riding since they were 4, but had to take it - which I'm fine with. The cost seemed a bit higher than it should be though (over $250 IIRC). A motorcycle license with all the mandatory training will set you back about 1,400€ (1,675 USD) over here. But at least we have half way competent riders and much lower fatality rates because of that. jsonder and tegs like this. You do take driving (and riding) safety a lot more serious over there. I would like to see an increased level of skill and concentration given to driving a car, over here. More rules and regulations translate to a safer society in general. Like some Americans, I'm not always prepared to make that trade-off. Tiered licensing with a mandatory year or two in the 250 cc or smaller engine size should prevent a significant fraction of the new rider deaths. I'm afraid that table doesn't say much. The numbers would need to be in correlation with the total number of bikes in each cc class. If for example only 2% of people ride bikes with less than 500cc then 7% of fatalities would be awful. As is that table contains no usable info. Agreed, but such info is limited. The table below shows USA data. 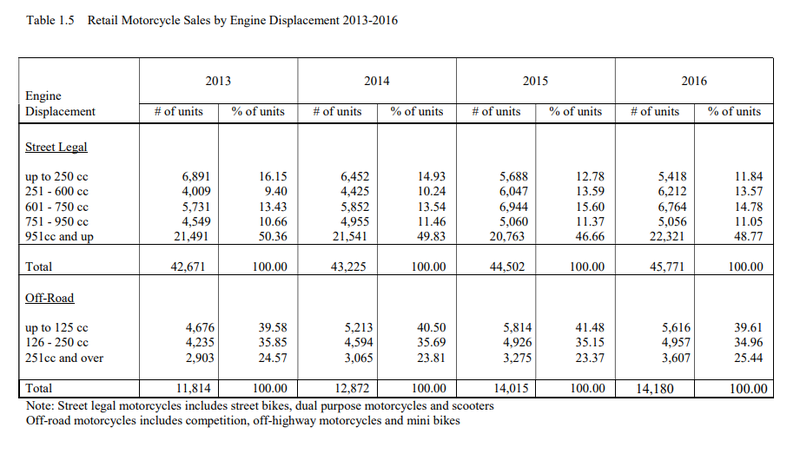 Even if you ignore the off road motorcycles, the percentage of bikes under 500 cc has got to be a bit larger than the 0-250 cc data in this table.